Hospitals in the city have reported increased numbers of patients suffering from heat-related illnesses, according to state media, and the Shanghai zoo said it was putting large blocks of ice into some animal enclosures to help them beat the heat, while providing frozen apples to its pandas. China's most populous city has baked under soaring summer temperatures for more than two weeks and Friday afternoon reached the hottest point since the establishment of its benchmark weather station in 1872, the municipal weather bureau said. Other areas of China also have seen records set in recent weeks, in what has been a torrid summer so far for much of the country, while large areas of south-central China have endured raging floods from torrential rain. 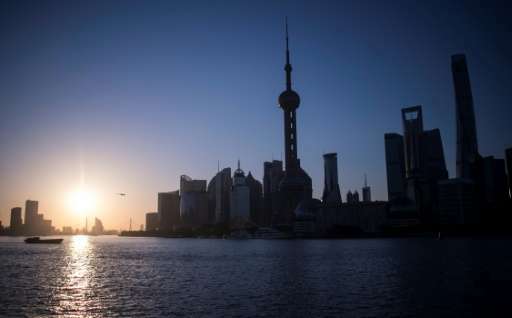 Shanghai's "red alert"—the first this year—is triggered when temperatures in excess of 40 degrees are forecast and comes with a warning to citizens to keep cool and avoid too much time outdoors, especially children, the elderly, or the sick. It also puts authorities on heightened alert against fires breaking out and advises special care with perishable foods to prevent spoilage and bacteria. Shanghai is getting hotter—the previous record of 40.8 degrees was set only in 2013, and eight of the 12 highest temperatures reached over the past century were recorded in the last five years, according to the city weather bureau. People are losing their cool, said the state-run Shanghai Daily. Shanghai has "seen a spike in accidental injuries, triggered by fights or traffic accidents, as people are more easily irritated in the extreme heat and failing to exercise proper judgment," it said Friday. Even dogs are on edge, according to a state media report this week that said the heat wave has coincided with a rise in dog bites. Shanghai's weather bureau said Thursday a stubborn subtropical high and hot southwesterly winds were to blame and that the city will continue to bake at least until early August when typhoon season begins and the weather begins to shift.